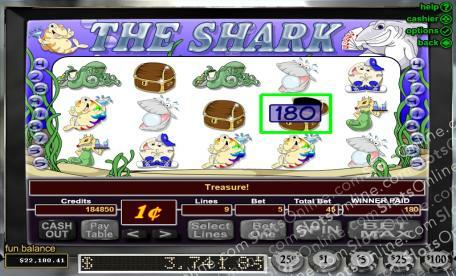 Join Sharky the pool shark and his underwater friends for a night of gambling fun. Click here to play! If you can beat these tough creatures at their games, you'll be walking away with a treasure chest full of cash! The sunken treasure chests act as a scatter. Three or more anywhere on the board will reward you with a mystery prize. Win up to 495 coins. Three or more of Sharky the card shark anywhere on the board will trigger a bonus game in which you will try to guess if your dealt card is higher or lower than Sharkeys. You can play up to three times and can be rewarded with up to 2700 coins.